The stator of a 3 phase IM (Induction Motor) is made up with number of stampings, and these stampings are slotted to receive the stator winding. The stator is wound with a 3 phase winding which is fed from a 3 phase supply. It is wound for a defined number of poles, and the number of poles is determined from the required speed. For greater speed, lesser number of poles is used and vice versa. When stator windings are supplied with 3 phase ac supply, they produce alternating flux which revolves with synchronous speed. The synchronous speed is inversely proportional to number of poles (Ns = 120f / P). This revolving or rotating magnetic flux induces current in rotor windings according to Faraday's law of mutual induction. As described earlier, rotor of a 3 phase induction motor can be of either two types, squirrel cage rotor and phase wound rotor (or simply - wound rotor). Most of the induction motors (upto 90%) are of squirrel cage type. 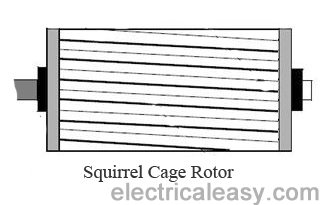 Squirrel cage type rotor has very simple and almost indestructible construction. This type of rotor consist of a cylindrical laminated core, having parallel slots on it. These parallel slots carry rotor conductors. In this type of rotor, heavy bars of copper, aluminum or alloys are used as rotor conductors instead of wires. 1. it reduces locking tendency of the rotor, i.e. the tendency of rotor teeth to remain under stator teeth due to magnetic attraction. The rotor bars are brazed or electrically welded to short circuiting end rings at both ends. Thus this rotor construction looks like a squirrel cage and hence we call it. The rotor bars are permanently short circuited, hence it is not possible to add any external resistance to armature circuit. Phase wound rotor is wound with 3 phase, double layer, distributed winding. 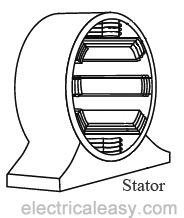 The number of poles of rotor are kept same to the number of poles of the stator. 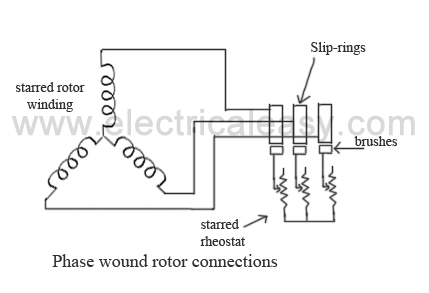 The rotor is always wound 3 phase even if the stator is wound two phase. The three phase rotor winding is internally star connected. The other three terminals of the winding are taken out via three insulated sleep rings mounted on the shaft and the brushes resting on them. These three brushes are connected to an external star connected rheostat. This arrangement is done to introduce an external resistance in rotor circuit for starting purposes and for changing the speed / torque characteristics. When motor is running at its rated speed, slip rings are automatically short circuited by means of a metal collar and brushes are lifted above the slip rings to minimize the frictional losses.